To blow the whistle, hold it between your lips with the solid side in your mouth. Place the tip of your tongue on the back of the whistle (solid side) BEING CAREFUL not to obstruct the holes. Now whistle as if you were naturally whistling with your tongue thus forcing the air you blow thru the top hole and out thru the open front of the whistle. 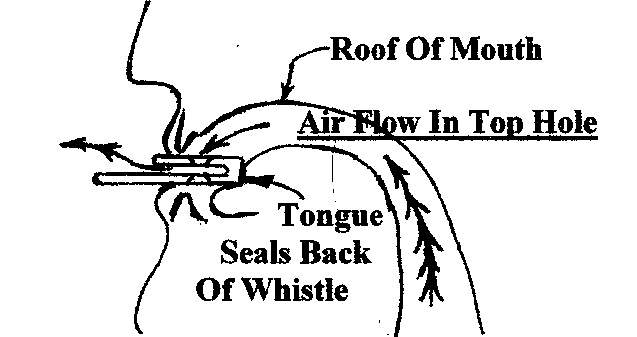 You will have the tip of your tongue touching the center of the solid back of the whistle. Pitch changes can be accomplished by moving the tip of your tongue against the back of the whistle plus changing the curling of your tongue. With practice and perseverance you wil be able to whistle a tune with ease. Click here to view our dog whistles and training products.